Sign up and receive Property Email Alerts of Houses for sale in Gansbaai, Gansbaai. 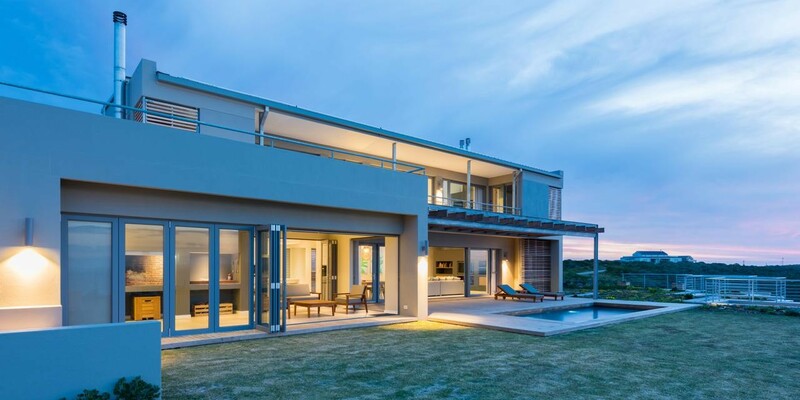 Three storey home in the magnificent eco-estate of Gansbaai is a tribute to green living. Truly unique in its design and styling. The house is built to compliment the natural slope of the property, effectively making its lower level underground. Spacious open plan living rooms with porcelain tiles and Piazette Italian fireplace in the lounge opens out to a deck and pool. Aluminium doors offer seamless flow between indoor and outdoor living space and an unobstructed sea view. The indoor built-in braai and bar area provides the perfect opportunity for alfresco dinning. In keeping with the eco-friendly theme, a modern kitchen is fully fitted with Meile low energy, new generation appliances, and complements the simple, linear style of this property. Five luxurious bedrooms all en-suite offer private verandas with magical sea views. The master suite is fitted with a Piazette Italian fireplace and secluded outdoor shower. The untreated hardwood and indigenous garden of this exceptional property compliments the natural fynbos and beach surroundings. Added features include: Additional separate guest suite with private deck, solar heated geyser and pool, electric car charging station, Fibre, and outdoor firepit with balau seating. NB: Over the last 13-month period the home as been used as an income-generating property, and has achieved confirmed gross rental bookings of over R965,000 (approx. R75,000 per month). Should the property continue to be correctly managed, an annual gross rental booking value in excess of R2,000,000 is certainly achievable. Sign-up and receive Property Email Alerts of Houses for sale in Gansbaai, Gansbaai.